Distinguish between biotic and abiotic (physical) components of an ecosystem. Ecosystems are made up of living and non-living components. The living part of the environment consists of the organic part of the ecosystem; animals, plants, algae, fungi and bacteria. These are called biotic components. The non-living part of the environment is made up of physical components such as; air, light, water, temperature, soil, minerals and climatic atmosphere. These are called abiotic components. These two components work together to sustain the environment. Define the term trophic level. 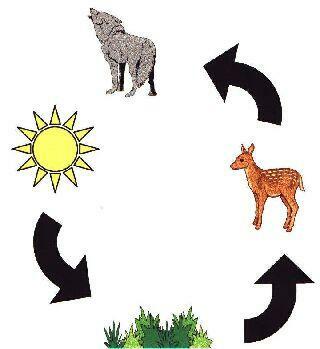 Trophic level refers to the feeding level within a food chain. It is the position that an organism occupies in a food chain, or a group of organisms in a community that occupy the same position in food chains. Identify and explain trophic levels in food chains and food webs selected from the local environment. *Producer: The organism in the ecosystem that converts abiotic components into living matter, they help the ecosystem by producing new biological matter. *Consumer: These organisms cannot produce their own food, so they eat other organisms to get the energy and matter they need. * Decomposer: Feed on dead biomass which is created by the ecosystem. *Herbivore: Only feed on producers. *Carnivore: Feed on all organisms including producers and consumers. *Top carnivore: This organism can not be eaten by any other organism. Grass: Producer and autotroph, provide food for the deer. Deer: The primary consumer and herbivore of the grass. Wolf: The secondary consumer/Top consumer and carnivore, feeds on the deer and cannot be eaten by any other organism. Ecosystems contain many interconnected food chains that form food webs. Food chains always begin with the producers (usually photosynthetic organisms), followed by primary consumers (herbivores), secondary consumers (omnivores or carnivores) and then higher consumers (tertiary, top). Decomposers feed at every level of the food chain. Diagrams of food webs can be used to estimate the knock-on effects of changes to the ecosystem. Biomass and energy decrease at each trophic level so there is a limit in how much trophic levels can be supported in a ecosystem. Energy is lost as heat at each stage of the food chain, on only energy stored in biomass is passed on to the next trophic level. After 4 or 5 trophic levels there is not enough energy to support another stage. Explain the principles of pyramids of numbers, pyramids of biomass, and pyramids of productivity, and construct such pyramids from given data. Pyramids of numbers: This records the number of individuals in each trophic level. Pyramid of biomass: This represents the biological mass of the standing stock at each trophic level at a particular point in time. Biomass should also be measured in units of energy, such as J m-2. They can show greater quantities at higher trophic levels because they represent the biomass present at a given time. Both pyramids of numbers and biomass represent storages. Pyramid of productivity: This shows the flow of energy through each trophic level. Measured in units of flow gm-2 yr-1 or Jm-2 yr. In accordance with the second law of thermodynamics, there is a tendency for numbers and quantities of biomass and energy to decrease along food chains; therefore pyramids become narrower as one ascends. Discuss how the pyramid structure affects the functioning of an ecosystem. This Youtube clip explains the interactions in food chains and the vulnerability of the top carnivores. Define the term species, population, habitat, niche, community and ecosystem with reference to local examples. *Species: A group of of organisms that interbreed and produce fertile offspring. If two species breed together they create a hybrid, this cannot produce viable gametes and is sterile. *Population: A group of the same species living in the same area at the same time, and can interbreed. *Habitat: The environment in which a species normally lives. *Niche: Where and how a species lives. A species share of a habitat and the resources in it. *Community: A group of populations living and interacting with each other in a common habitat. *Ecosystem: A community of inter-independent organisms and the physical environment they inhabit. Describe and explain population interactions using examples of named species. Ecosystems contain many interactions between the populations, the interactions are varied and can be divided into; competition, predation, mutualism and parasitism. *Competition: A common demand by two or more organisms upon a limited supply of a resource; for example, food, water, light, space, mates, nesting sites. It may be intraspecific or interspecific. *Parasitism: A relationship between two species in which one species (the parasite) lives in or on another (the host), gaining all or much (in the case of the partial parasite) of its food from it. *Mutualism: A relationship between individuals of two or more species in which all benefit and non suffer. *Predation: This is when on animal or plant hunts and eats another animal. Here are 3 Youtube links about Interspecific interactions.